Are you a Galanthophile ? Having promised a kinder, gentler, less… alimentary… entry for today, I found inspiration under a birch tree in the garden. Small, unassuming, a welcome sight during early in the new year, Galanthus nivalis – the snowdrop – is frequently seen but rarely looked at. Often we don’t bend down to really see them. And as they’re small and the heads droop down and hide their complexity and beauty many of us probably don’t take the time to stop and look. Nature’s attention to detail is stunning. 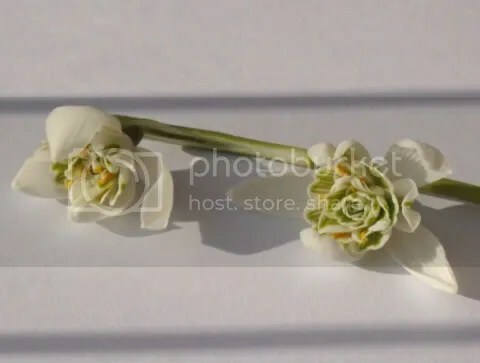 While I’d always rather see them in clumps in a field – or in vast spreading carpets if you visit one of the snowdrop gardens across the UK such as Colesbourne Park in Gloucestershire – than picked and looking insignificant and rather sad in a vase, they’re always worth a closer inspection. We visited Colesbourne Park several times when we lived in Wiltshire and were surprised by the vast range of snowdrops available. There may be as many as 500 cultivars and precise snowdrop identification can be tricky. If you love snowdrops, here are a few links to take your interest further.